10+ Best Free Vintage Fairy Images! Today we’ve rounded up our 10+ Best Free Vintage Fairy Images for you! We’ve searched through our extensive Image Archives here at The Graphics Fairy to find our favorite Fairy pictures. We also threw in a few Fairy Themed projects for inspiration! 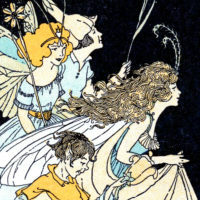 This is a great collection of some of our most beautiful Fairy Downloads. In this post, you’ll find 10+ links to our delightful and cute Fairy Graphics! 1) VINTAGE BUTTERFLY FAIRY LADY This stunning Real Photo Postcard shows a lady dressed up in a Fairy Costume complete with huge Butterfly wings and a long floral garland. This is a European card that dates back to 1908. 2) FRENCH FAIRY LABEL This is a darling old Advertisement for ladies Powder that was made in Paris showing cute little Fairies inspecting the powder! A delicate Floral Frame surrounding French Typography runs along the bottom. There are two versions: the original and the second one that has the text removed, so that you could use this as a label and write what you like inside of the Frame. 3) VINTAGE CLIP ART – FAIRY SHEET MUSIC These 4 Fairy themed images from antique sheet music covers are so beautiful. Did you know there are horse fairies with dragonfly wings? 5) VINTAGE CLIP ART IMAGE – HOUSEHOLD FAIRY This is The Modern Household Fairy, an antique advertisement for Sapolio soap. She is simply beautiful with her gorgeous wings and the little star on her head. So pretty! 6) GORGEOUS VINTAGE BLUE FAIRY IMAGE This image is a beautiful blue fairy with her wings open, wearing a hat with a jewel in front and a long feather coming out of it. She is holding a wand, and is wearing a long blue outfit with draped sleeves, while pulling open her canopy where she sleeps. 7) VINTAGE ROSE FAIRY BABY GRAPHIC This picture shows a dear little Fairy Baby! She’s sitting next to a Pink Cabbage Rose and appears to be writing a love note on one of the Petals. Such a sweet nostalgic image! 8) VINTAGE CLIP ART – 3 FLOWER FAIRIES You will find 3 sweet flower Fairies for you to use in your art! They are: Wild Rose Fairy, a Lily of the Valley Fairy, and a baby Violet Fairy. These make such cute cards!! You can find some of their siblings HERE. 9) FREE VINTAGE CLIP ART – FLOWER FAIRIES FOR SPRING Here are three adorable little flower fairies for you to play with!! These are from a 1910 children’s book. You my recall the Christmas versions that I shared HERE. 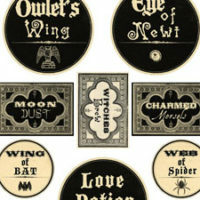 These are great images for card making! 10) VINTAGE IMAGE – CUTE LITTLE FAIRY ON BUTTERFLY This is a really fun antique trade card! This one features a tiny Fairy riding on a Colorful Butterfly! She looks like she could be the sister of the #11 Fairy below. They both have the same mischievous grins! 11) FAIRY IN MOONLIGHT DOWNLOAD This is a charming old Graphic showing a Fairy Lady at night. She’s resting on some bright purple flowers with the Moon and Stars in the background. So magical looking! 12) COLORFUL FAIRY CHILDREN – This is a charming image, showing 2 Children. One of them is a Fairy with brightly colored Wings. They have such sweet faces! These fun Fairy projects are perfect to use in your next Fairy Craft Project! You can learn all of the FREE Techniques by clicking on the links below! 1) HOW TO MAKE FAIRY GARDEN ACCESSORIES – WATERPROOF TECHNIQUE Learn a way to use some of your favorite Graphics Fairy motifs without worrying that the prints would turn to mush at the first touch of dew. With this technique, you can safely use your favorite Graphics Fairy images in your very own Fairy Garden! This really is a very simple project, but it does require a bit of fussy cutting. 2) TABLETOP FAIRY FOREST – FRENCH MINI PLANTER BOXES This fun project uses upcycled materials and twigs from the yard to create a forest for fairies! This classic design depends on a basic square box, so that got me to snooping through the recycle bin…I’ll bet you can find several alternatives if you ransack the pantry! 3) AT THE FAIRY BISTRO – READER FEATURE Anyone who is a fairy lover will love this mini Fairy Bistro Set! The table and chairs were created using silicone muffin cups, plaster, and skewers for the legs. Michelle also used a flat bead to create the design for the inlay on the top of the table. This project has such a magical and relaxed feel to it! 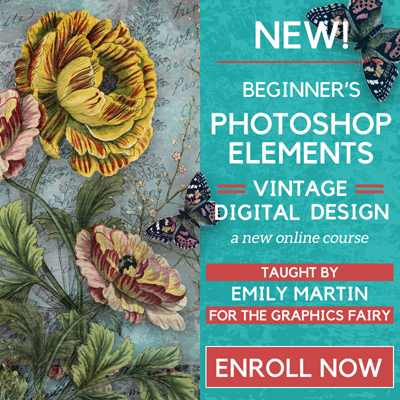 You might also like our Beginner’s Photoshop Elements Vintage Digital Design eCourse , available in The Graphics Fairy Courses Here. 12+ Free Vintage Mother’s Day Images! 10+ Halloween Printables – Free 2 Fairy Party Images – Vintage Style! These are FANTASTIC!! Thank you so much. Thank you! These are such sweet fairies!